understand how scientists measure and compare earthquakes. be familiar with processes that take place in an earthquake such as faulting, tectonic creep, and seismic waves. know which global regions are most at risk for earthquakes and shy they are at risk. know and understand the effects of earthquakes, including shaking, ground rupture, and liquefaction, as well as how earthquakes are linked to other natural hazards such as landslides, fires, and tsunamis. know the important natural service functions of earthquakes. know how human beings interact with and affect the earthquake hazard. understand how we can minimize seismic risk, and recognize adjustments we can make to protect ourselves. Image copyright: United Nations Development Programme, licensed as Creative Commons Public Domain. Recall that all around the planet, tectonic plates are moving because of convection in the mantle. Tectonic plates are also composed of two types of crust, oceanic and continental. The oceanic crust, which is made mostly of basalt is more dense than continental crust that is made of granite. When these tectonic plates come in contact, the denser oceanic crust subducts below the continental crust. Any place that plates come in contact, stress will build as the force of their movement causes a push on each other. As the rocks begin to bend under tectonic forces, large amounts of deformation - called strain - occurs. In some places, the strain is shown as aseismic creep, which is the gradual bending or movement along a fault. In other places, the fault can become locked. When the stress becomes too great for the rocks to hold, segments may suddenly snap, releasing large amounts of energy. This is called the elastic rebound theory. Movement along a fault can occur vertically or horizontally. The greatest horizontal displacement was 21 feet along the San Andreas Fault in the Great San Francisco Quake of 1906. Imagine in an instant being moved 21 feet horizontally! The greatest maximum vertical displacement used to be the Alaskan earthquake in 1964. The vertical displacement was 33 feet! But on December 26, 2004 a 9.1 underwater earthquake occurred in Indonesia. It had a vertical displacement of 60 feet over 800 miles long! Imaging being thrown 60 feet instantly and that it occurred for 800 miles. The compression caused by the oceanic-oceanic convergence actually sped up the earth's rotation 2.676 millionths of a second and shifted the axis 1 inch! It produced a massive tsunami traveling 500 mph. Over 240,000 died from the earthquake and tsunami; one in three were children. The image below if of an earthquake in Pakistan that killed 80,000. There are several types of faults that earthquakes occur on, which are dependent on whether the fault is occurring because of convergent, divergent, or transform tectonic plate forcing. Geologists use old mining terms to distinguish between different types of faults. Think of a minor walking down into the earth along a fault line. The ground the miner is walking on is called the footwall. If the minor needs to hand their lantern, the ceiling is called the hanging-wall. Normal faults (B) are common along divergent plate boundaries. As extensional forces occur, the footwall is forced upward, while the hanging wall slides downward. This can create a series of valleys (called a graben) and mountains (called a horst). Examples of mountain ranges and valleys created by normal faulting are theGrand Tetons, the Basin and Range in the western United States, and the Wasatch Front in Utah. Reverse faults (C) are caused by compressional forces as tectonic plates collide together forcing one plate to rise above another. Using the mining terminology, movement along a reverse fault would cause the hanging-wall to rise up and the footwall to drop lower. The angle of a reverse fault is about 45 degrees, but if the angle of the fault is steeper than 45 degrees it is called a thrust fault. When two plates collide, intense folding and faulting can occur. Examples of where reverse and thrust faults occur are where convergent boundaries are common such as: the Northern Rocky Mountains, the Alps, Himalayas, and the Appalachian mountains. Image copyright: United States Geologic Survey, licensed as Creative Commons Public Domain. Seismologists record seismic waves using a seismograph. When a rupture occurs within the earth, energy is released from the focus in all directions and the seismograph will record the magnitude of the energy. There are three types of seismic waves: P-waves, S-waves, and Surface waves. Primary waves, also called P-waves, are compressional waves and are the first to be felt by seismographs and individuals because they travel the fastest (about 3.7 miles per second). To visualize a P-wave, think of stretching a slinky and letting it go. You would be able to actually see the compression occurring within the slinky. The second type of seismic wave is called a secondary wave or S-wave. They reach the seismograph second because they travel slower than P-waves and travel in a side-to-side manner. Imaging pulling a slinky and shaking one end side to side. You would be able to see the side-to-side movement travel up the slinky. P-waves and S-waves together are called body waves because they travel through the earth rather than on the surface. Surface waves are the last seismic waves to reach an area, create the greatest ground motion, and are the most destructive because they are the slowest and move in a rolling manner. In order to determine the location of an earthquake, seismologists must measure the interval distance of P-waves and S-waves released during the rupture. P-waves travel faster than S-waves, thus scientists calculate the time difference between both waves to determine a perimeter of the epicenter. But the epicenter could be anywhere within that perimeter. Therefore, scientists must use a minimum of three seismic readings from different seismograph stations in order to determine the exact location of the epicenter. Image copyright: Licensed as Creative Commons Public Domain. There are two basic ways to measure the strength and destructive power of an earthquake. The first is called the Richter scale. Based on a range from 1 (weakest) to 10 (strongest), the Richter scale measures the magnitude (energy released) by an earthquake. The scale is logarithmic meaning that every whole number increase in magnitude is 10 times more ground shaking and 30 times more energy released. Example: a magnitude 7.0 earthquake has ground shaking 10 times more than a 6.0 and 30 times more energy released. A magnitude 8.0 earthquake has ground shaking 100 times more than a 6.0 and 900 times more energy released. The December 26, 2004 Indonesian earthquake had a magnitude of 9.1. It should be noted that for the strongest earthquakes, the Richter Scale is no longer used. Instead, the Moment Magnitude Scaleis used, though it is very similar to the Richter Scale. The Richter Scale and Moment Magnitude Scale provide quantitative information of the energy released from an earthquake. 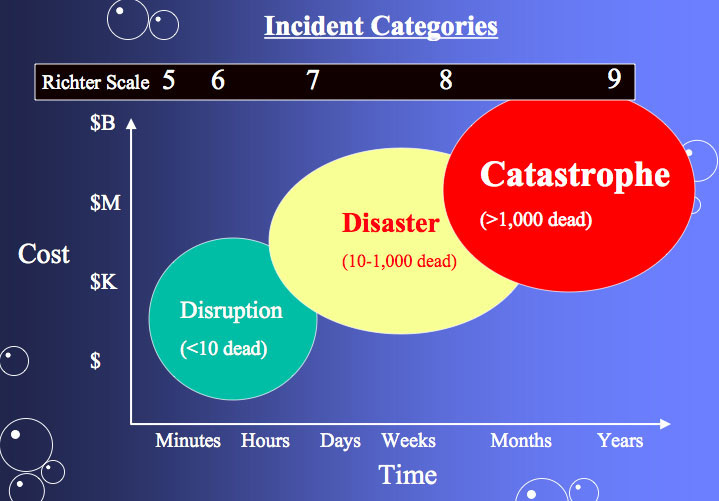 The Modified Mercalli Intensity Scale (shown below) is more qualitative and focuses on the actual damage caused by the earthquake and its impact on human lives and property. The scale has 12 categories ranging from I (felt by very few people) to XII (total destruction). Each category is based on a description of how people felt or perceived the earthquake. The major problem with the Modified Mercalli Intensity Scale is that ground damage is relative to location. The scale can be influenced by the types of rocks underneath, if the ground is mostly bedrock, loose sediment, or even landfill, how well buildings are built, and how far away the people and buildings are from the epicenter. The farther away from the epicenter, the weaker the earthquake will feel. So the Modified Mercalli Intensity Scale is great to determine ground damage and how the earthquake affected people, but does not tell you how much energy was actually released from the rupture. Because of the access to the Internet, the United States Geologic Survey (USGS) allows you to email them if you just felt and earthquake. They take this information and create a map similar to the Modified Mercalli maps, but call it a shake map. To view real-time shake maps from the USGS, click here. For a list of recent earthquakes in Utah along with shake maps, check out the Seismology Department at the University of Utah. One final note, with the recent popularity of smart phones and the iTouch, there are several apps now available in relation to natural disasters. In terms of earthquakes, a highly popular app in Apple's iTunes is called QuakeWatch. There are probably similar apps for other smart phone devises. Image copyright: United Nations Development Program, licensed as Creative Commons Public Domain. Earthquakes do not kill people; falling buildings and highways kill people. History has taught us the importance of building codes to create safer buildings. Many of the massive death tolls reported by earthquakes are caused by poorly built buildings rather than the earthquake itself. In general, buildings or structures built out of brick, stone, mud, or reinforced concrete fair poorly in large earthquakes because there is very little flexibility in the structures as the ground shakes. The best types of buildings to be in are those built of wood because of there flexibility; the house may not be habitable after the earthquake, but they won't crumble or collapse on people. Buildings with weak floors or basement garages are also susceptible to collapsing. There are several techniques engineers have developed to help buildings withstand the destructive power of earthquakes. Many buildings are being built or retrofitted with diagonal braces that can withstand the ground motions caused by an earthquake. Tall buildings also tend to sway at different frequencies them to slam into each other during an earthquake. If engineers know how much a building will sway, they can determine how far apart buildings must be built. Finally, engineers are placing rubber pads at the base of newly built and retrofitted buildings that act as shock absorbers. Liquefaction can occur when earthquakes rupture in regions with loose sediment and high water tables. As the ground shakes, the high water table rises to the surface which softens and destabilizes the surface causing structures to break off their foundations or fall over. Liquefaction has occurred in Mexico City in 1985, San Francisco 1989, Anchorage, Alaska 1964, Kobe Japan in 1995 and will occur in Salt Lake City. Image copyright: This work is in the public domain in that it was published in the United States between 1923 and 1977 and without a copyright notice. Click here to see a map of liquefaction potential and ground shaking within Salt Lake County. (You can also look at maps for Tooele, Cache, Davis, Weber and Utah Counties.) For those who live in the Salt Lake valley, notice how the liquefaction potential is greatest along the Jordan River and near the Great Salt Lake. Any ideas why? It has to do with the fact the water table is highest near those areas. So when an earthquake occurs and the ground begins to shake, the water will rise and destabilize the ground. In these maps, the reds and purples represent the areas of greatest liquefaction potential from a magnitude 7.0 earthquake. Earthquakes can also destabilize steep slopes causing them to slip and fail. These landslides tend to occur where the ground is mostly loose sandy soil with a high water table. Fires are also another serious hazard created by earthquakes as our infrastructure collapses and electrical and gas lines break. The treat of fires will also increase as emergency crews have a hard time maneuvering through the debris. There are two simple things individuals can do to reduce their risk of a fire: first is to have a wrench attached to their outside gas line. If you smell gas at your house, quickly turn off the gas. But if you do not smell gas, do not turn it off; doing so may prevent you from having heating in your house in the winter and it may be months before it gets turned back on. Second, make sure your water heater is attached to your house. A simple $20 bracket wrapped around your water heater and bolted into your house may prevent it from falling over and breaking its gas line. Another interesting effect of powerful earthquakes is island creation. In September 2013, a moderately powerful earthquake off the coast of Pakistan created a 200 foot wide, 60 foot tall island. It won't last long because ocean waves will erode it back down, but it's an interesting and rare effect of earthquakes. Click here to learn more. Can humans create earthquakes? Maybe not intentionally, but the answer is yes and here is why. If a water reservoir is built on top of an active fault line, the water may actually lubricate the fault and weaken the stress built up within it. This may either create a series of small earthquakes or potentially create a large earthquake. Also the shear weight of the reservoir's water can weaken the bedrock causing it to fracture. Then the obvious concern is if the dam fails. Earthquakes can also be generated if humans inject other fluids into a fault such as sewage or chemical waste. Finally, nuclear explosions can trigger earthquakes. In fact, one way to determine if a nation has tested a nuclear bomb is by monitoring the earthquakes and energy released by the explosion. Everywhere in the world has disasters, so nowhere is safe. But everyone should be prepared for the type of disasters their region experiences. Everyone should have a 72 hour kit prepared in your car and house. Recently the Federal Emergency Management Agency (FEMA) stated that citizens should prepare a 5-day kit in case federal, state, and local agencies can not reach you. Learn more how you can prepare at Ready.gov. Here are a few more items you should think about with disaster preparedness. Each member in your family should also know where to meet in case of a disaster. The number one reason why people end up in the hospital after an earthquake is glass in their feet. Having a pair of old shoes under your bed can greatly reduce that probability. Know how to shut off your gas line if you smell gas in your house. If it requires a wrench to shut off, always have one next to the line for quick shutoff. You will know if you have a gas leak because the gas companies place a chemical in the gas that will smell like rotten eggs. Also make sure your water heater is attached to your house. If your water heater falls over and the gas line breaks, your house can catch fire. If you and your family are safe, take care of others in need. Finally for those interested, look into getting CERT certified as a first responder.